In this sense there are especially valuable the works of Pietak [2,3] although they are no experimentally proven, where the three dimensional architectures of developing plant flower buds show striking parallels with the resonance patterns that electromagnetic energies can form. But is not the principal line of investigation on the morphogenetic - EM fields relation, there are more experimentally proved issues like electric currents that guide the migration of cells: for example Cao et al. reported electric field dependent migration of neuroblasts, and as reviewed by Levin et al. specific voltage range is necessary for demarcation of eye fields in the frog embryo and, artificially setting other somatic cells to the eye-specific voltage range resulted in formation of eyes in aberrant locations, including tissues that are not in the normal anterior ectoderm lineage: eyes could be formed in the gut, on the tail, or in the lateral plate mesoderm.
" The genome is tightly linked to bioelectric signaling, via ion channel proteins that shape the gradients, downstream genes whose transcription is regulated by voltage, and transduction machinery that converts changes in bioelectric state to second-messenger cascades. However, the data clearly indicate that bioelectric signaling is an autonomous layer of control not reducible to a biochemical or genetic account of cell state." " Early frog embryos exhibit a characteristic hyperpolarization of cells lining the neural tube; disruption of this spatial gradient of the transmembrane potential (Vmem) diminishes or eliminates the expression of early brain markers, and causes anatomical mispatterning of the brain, including absent or malformed regions. This effect is mediated by voltage-gated calcium signaling and gap-junctional communication." Wells  focused on plasma membrane patterns that generate endogenous electric fields that provide three-dimensional coordination systems for embryo development. In a review by Funk  he distinguishes two type of issues: low magnitude membrane potentials and related electric fields (bioelectricity), and cell migration under the guiding cue of electric fields (EF). He described for example how in osteoblasts, the directional information of EFs is captured by charged transporters on the cell membrane and transferred into signaling mechanisms that modulate the cytoskeletal and motor proteins, resulting in a persistent directional migration along an EF guiding cue. Among others, EF activate a number of channels and that variations in the extracellular and intracellular environment as well as the distribution of channels on the membrane contribute to the galvanotactic response .
" Complex pattern formation requires mechanisms to coordinate individual cell behavior towards the anatomical needs of the host organism. Alongside the well-studied biochemical and genetic signals functions an important and powerful system of bioelectrical communication. All cells, not just excitable nerve and muscle, utilize ion channels and pumps to drive standing gradients of ion content and transmembrane resting potential. In this chapter, we discuss the data that show that these bioelectrical properties are key determinants of cell migration, differentiation, and proliferation. We also highlight the evidence for spatio-temporal gradients of transmembrane voltage potential as an instructive cue that encodes positional information and organ identity, and thus regulates the creation and maintenance of large-scale shape. In a variety of model systems, it is now clear that bioelectric prepatterns function during embryonic development, organ regeneration, and cancer suppression." Electric fields, magnetic fields and electromagnetic fields can determine how cells move and adhere to surfaces; how the migration of multiple cells are coordinated and regulated; how cells interact with neighboring cells, and also be associated to changes in their microenvironment .
" ..Similar to the abutilon ovary and squash male flower bud, cells in the female squash ovary in regions that correlate to highest electric field strength have changed into placental tissue cells, while the six places of high magnetic field strength are also the six places where ova form in the squash ovary (Figure 5).."
" Overall, the structural evidence and physical uniqueness of EM mode patterns indicates developing plant organs can support EM resonances, whereby the electric and magnetic field components guide symmetry-breaking and therefore resemble the first pattern to emerge in primordia. Rich in positional information, the EM resonant mode represents a possible physical manifestation of the morphogenetic field." The question of which can be the sources of those endogenous EM fields are treated in other sections, for example Fröhlich propose and theorize a EM production in the range from 1011 to 1112 Hz (the same frequency range as proposed in the above mentioned Pietak papers) and this have a specific section on this site , water and its interactions in coherent domains  or microtubule vibrations  can also be sources, and of course it must be taken into account that we are all living under a giant EM resonator that is our planet earth-ionosphere cavity and maybe we are using/adapting it also. 2. Pietak, Alexis Mari. "Electromagnetic resonance and morphogenesis." Fields of the Cell (2015): 303–320. ISBN: 978-81-308-0544-3. 3. Pietak, Alexis Mari. "Structural evidence for electromagnetic resonance in plant morphogenesis." Biosystems 109.3 (2012): 367-380. 4. Cao, Lin, et al. "Endogenous electric currents might guide rostral migration of neuroblasts." EMBO reports 14.2 (2013): 184-190. 5. Tseng, AiSun, and Michael Levin. "Cracking the bioelectric code: probing endogenous ionic controls of pattern formation." Communicative & integrative biology 6.1 (2013): 13192-200. 6. Levin, Michael. "Endogenous bioelectrical networks store non‐genetic patterning information during development and regeneration." The Journal of physiology 592.11 (2014): 2295-2305. 7. Pai, Vaibhav P., et al. "Endogenous gradients of resting potential instructively pattern embryonic neural tissue via notch signaling and regulation of proliferation." The Journal of Neuroscience 35.10 (2015): 4366-4385. 8. Wells, Jonathan. "Membrane patterns carry ontogenetic information that is specified independently of DNA." BIO-complexity 2014 (2014). 9. Funk, Richard HW. "Endogenous electric fields as guiding cue for cell migration." Frontiers in physiology 6 (2015): 143. 10. Lobikin, Maria, and Michael Levin. "Endogenous bioelectric cues as morphogenetic signals in vivo." Fields of the Cell (2015): p. 283–302. ISBN: 978-81-308-0544-3. 13. Iwasa, Stephanie N., Robart Babona-Pilipos, and Cindi M. Morshead. 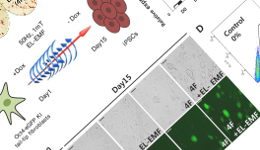 "Environmental factors that influence stem cell migration: an “electric field”." Stem cells international 2017 (2017). 14. Ross, Christina L. "The use of electric, magnetic, and electromagnetic field for directed cell migration and adhesion in regenerative medicine." Biotechnology progress 33.1 (2017): 5-16.